One way one could complete this problem would be to find all factors of the given number, and loop through checking if they are prime, returning only the largest one. To start out, let’s find all factors of a number. Now we simply grab the largest number in the list by sorting it and grabbbing the last item! print "Broken out of counter"
So what we need to do is find a way to take the starting values of 0 and 1, and as each iteration passes, set a to the value of b, and b to the value of a+b, returning a each time. Sounds like a job for generators! Next, we loop through each of the returned values, checking if it is even. If so, add it to a running total. There you have it, using generators Project Euler problem 2 was a breeze! and I couldn’t in good conscience let an opportunity pass to learn a new language. 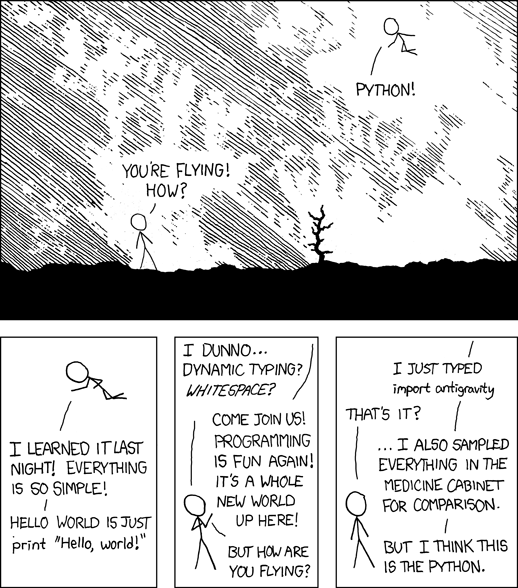 I grabbed a copy of “Dive Into Python” from the internet (see the link on my sidebar) and got started. I spent a few days writing simple apps going along with the book, but got bored fairly quickly. As someone who has conquered several programming languages at this point, it is difficult to find your mind stimulated by programs designed for new programmers. After a few Google searches, I stumbled upon Project Euler. For those who are not familiar with Project Euler, it is a collection of language-agnostic programming/math problems that are designed to help programmers keep (or develop) their edge. Each problem is designed in such a way that an efficient algorithm should provide the correct answer in 60 seconds or less in any language. I decided to give it a go, and have enjoyed myself greatly in the process. I plan on attempting to complete each challenge in a variety of languages, in an attempt to compare and contrast each language. How many of you have tried Project Euler, and what has your experience been?